#1 NEW YORK TIMES BESTSELLER - For fans of The Hunger Games, Divergent, and Red Rising comes a gripping sci-fi adventure in which a group of teenagers wake up in a mysterious corridor with no knowledge of who they are or how they got trapped. Their only hope lies with an indomitable young woman who must lead them not only to answers but to survival. "I open my eyes to darkness. Total darkness. I hear my own breathing, but nothing else. I lift my head . . . it thumps against something solid and unmoving. There is a board right in front of my face. No, not a board . . . a lid." A teenage girl awakens to find herself trapped in a coffin. She has no idea who she is, where she is, or how she got there. Fighting her way free brings little relief--she discovers only a room lined with caskets and a handful of equally mystified survivors. Beyond their room lies a corridor filled with bones and dust, but no people . . . and no answers. She knows only one thing about herself--her name, M. Savage, which was engraved on the foot of her coffin--yet she finds herself in charge. She is not the biggest among them, or the boldest, but for some reason the others trust her. Now, if they're to have any chance, she must get them to trust one another. Whatever the truth is, she is determined to find it and confront it. If she has to lead, she will make sure they survive. Maybe there's a way out, a rational explanation, and a fighting chance against the dangers to come. Or maybe a reality they cannot comprehend lies just beyond the next turn. Start reading Alive: Book One of the Generations Trilogy on your Kindle in under a minute. "A ripping, claustrophobic thunderbolt of a novel, Scott Sigler's "Alive" gives us an unforgettable young hero who must find the inner strength to lead without knowing where she is, who she is, and how bitterly the odds are stacked against her." --Pierce Brown, "New York Times" bestselling author of "Red Rising"
"Sigler has created a wonderful and engrossing character in M. Savage. Strong and smart, but with the naIvetE and misgivings of any teenage girl, she's someone you'll definitely want on your side when s*** hits the fan, which it most certainly does." --Veronica Belmont, host of "Sword & Laser"
"A tense, unsettling page-turner of a story--both deeply strange and wildly compelling." --Cherie Priest, author of "Boneshaker" and "Maplecroft"
"From the first page I was hooked. The puzzle unfolds masterfully, right down to the last page."--Dr. Phil Plait, author of "Bad Astronomy"
A ripping, claustrophobic thunderbolt of a novel, Scott Sigler s "Alive" gives us an unforgettable young hero who must find the inner strength to lead without knowing where she is, who she is, and how bitterly the odds are stacked against her. Pierce Brown, "New York Times" bestselling author of "Red Rising"
Sigler has created a wonderful and engrossing character in M. Savage. Strong and smart, but with the naivete and misgivings of any teenage girl, she s someone you ll definitely want on your side when s**t hits the fan, which it most certainly does. Veronica Belmont, host of "Sword & Laser"
A tense, unsettling page-turner of a story both deeply strange and wildly compelling. Cherie Priest, author of "Boneshaker" and "Maplecroft"
From the first page I was hooked. The puzzle unfolds masterfully, right down to the last page. Dr. Phil Plait, Ph.D., author of "Bad Astronomy""
Suspenseful . . . ["Alive"] lives up to its hype, packing plenty of thrills. "Entertainment Weekly"
Fascinating and intriguing . . . a cross between "Lord of the Flies" and "The Maze Runner" and yet . . . so much more. " Fresh Fiction"
From the first page I was hooked. The puzzle unfolds masterfully, right down to the last page. 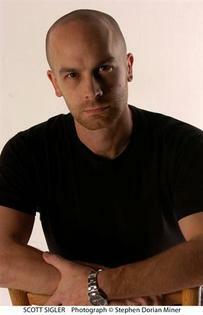 Dr. Phil Plait, Ph.D., author of Bad Astronomy"
Scott Sigler is the New York Times bestselling author of sixteen novels--including Alive and Alight--six novellas, and dozens of short stories. He is also the co-founder of Empty Set Entertainment, which publishes his YA Galactic Football League series. He lives in San Diego. 3.0 out of 5 starsA Mysterious And Engaging Idea. Alive is an easy book to enjoy because it is fast, you never quite know what's coming next and so you're always biting your fingernails after every chapter nervously anticipating what's going to jump out next. But I did struggle to connect with the characters, because there are many who suffer from poor fleshing out and this makes them hard to care about. Equally, some of the characters more at the forefront of the book suffer more from a lack of a strong, likeable voice and so the plot has to do all of the work to make you love this book. The premise is brilliant and is executed really well. Em wakes up trapped inside a coffin, alongside many other coffins containing who knows what or who, and somehow can't remember anything about her life - all she knows is she is 12, and that her initials are inscribed on her coffin. What's even more interesting however is that Em isn't 12 at all, and neither are the other people she rescues from their respective coffins, who feel exactly the same, with the same age and same Birthday as her. So of course you are hooked from page one and so you tumble down the rabbit hole along with Em and her crew. It's a gripping page turner without question. However I found Em, and sometimes her childlike mentality and decision making, frustrating ultimately and so I couldn't connect with her. Considering we have no idea of her back story, you might think that is the reason she didn't initially appeal to me but actually it's that she just loves to justify her actions and build her own ego, as the chosen leader naturally, instead of the reader having chance to decide they love her by themselves. I like to be lead into liking a character, but I almost felt like I was told how great she was before I'd even decided for myself. Nevertheless, Em keeps it interesting because she is full of surprises and has some shocking moments throughout the book - and let's face it, who wouldn't want to find out why they're there, why they don't remember their names and ultimately what on Earth is going on? A fun, gripping read that could have shone with slightly stronger characters. 5.0 out of 5 starsAn Excellent Surprise. Alive is a brilliant story, it is so carefully crafted that each section keeps you moving to the end. There are plenty of surprises and I had no idea where the characters were, I guessed but I was wrong and it was a complete surprise that was amazing but at the same time made complete sense when I reviewed all the clues after I finished the book. The author asked for any readers that write reviews to leave them spoiler free so all I will say is that this is similar to other YA books I've read but also completely different and now I'm dying to find someone else who has read it so that I can find out if they had the "Oh yes" moment I did when I found out what was going on. 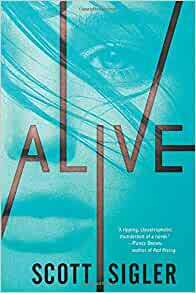 A little gory but so worth the read, Alive is one of the easier books to get lost in that I have read this year and I can't wait to read Alight when I have got a few more books off my TBR list. 4.0 out of 5 starsEnjoyable sci-fi for young adults. I'm a massive fan of Scott Sigler's GFL series (check out The Rookie to get started on that one), and although this is a completely different story (though not necessarily a different universe) I got into this new story very quickly. Excellent character development and an intriguing plot. Well worth reading and suitable for Young Adults. If I could use one word to describe Alive it would be STRANGE. From start to finish you are pulled in to a strange story and characters that you will either love or hate. For the most part I really enjoyed the book and I love Em and can't wait to see what happens in the next book!!! Another blazing success from Scott Sigler. I read this cover to cover in a day, perfectly paced action beats, suspense and well written character arcs all wrapped up a in YA package. If you're already a Sigler fan get this now, if you've not read him before get this now and then get the Infected trilogy, the GFL series, Nocturnal and (my personal favourite) Ancestor. Do it junkies, you know it makes sense. This book was literally nightmare inducing. I often read before sleep, but after 2 nights of nightmares I finished this story only in the day light hours. Gripping from the start, a lead character you fall for instantly and an unfolding scenario that is unlike anything I've ever encountered. @scottsigler thanks for the read. Again. This is the first Scott Sigler book I have read, and I have to say I am so happy that I came accross this little gem after a YouTuber (Anna Akana) recommended it! I haven't been able to put it down since I started reading it, Alive keeps you guessing until the end. Cannot wait for the rest of the trilogy!